Tomorrow, Indonesia conducts its third direct presidential elections. The race between Joko Widodo-Jusuf Kalla and Prabowo Subianto-Hatta Rajasa is close, something that few analysts predicted as recently as three months ago. This election is also momentously important for the future of Indonesian democracy. The stakes for Indonesia’s future are starker than I myself would have predicted three months ago. The latest polls have Jokowi-JK narrowly ahead. 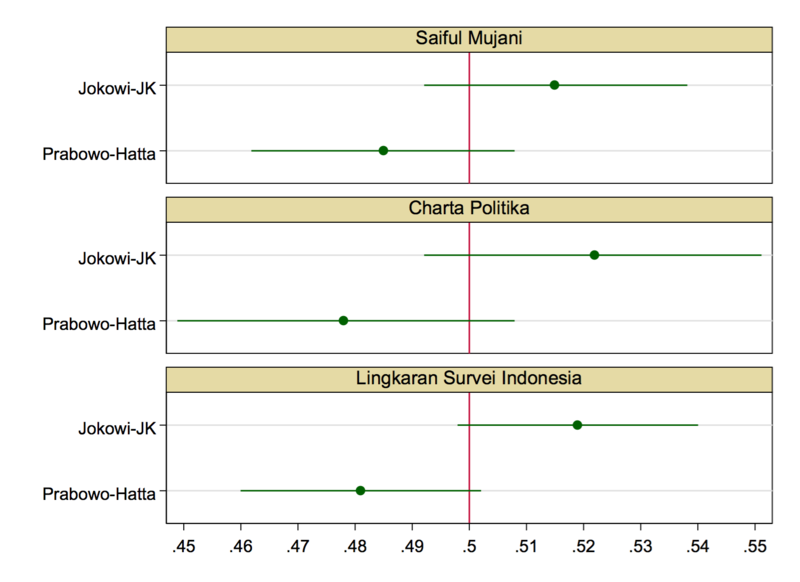 Here are the latest polls by Saiful Mujani Research and Consulting, Charta Politika, and Lingkaran Survei Indonesia, with estimates and 95% confidence intervals plotted (see here how we get the confidence intervals). Looking at these results, you should conclude that Jokowi’s lead is not commanding. Our best guess based on the polls is that he will win, but the confidence intervals around these point predictions overlap slightly. However, those figures are the percentage of survey respondents choosing each ticket—they do not add to 1 because they include undecideds. So, I have calculated the “two-ticket vote share,” which appears below (in calculating the CIs, I have adjusted the sample size by removing undecideds). We see more clearly here that that our best prediction based on these polls is a Jokowi-JK victory, but that the margin of error is large enough in these polls that the two confidence intervals overlap. If Prabowo-Hatta were to emerge victorious, it would not contradict any of the polls. Readers will note that I have been careful to stipulate that these are predictions “based on these polls.” Why? Because in this election (like in every other election anywhere in the world) the undecideds will prove crucial. However, unlike many other elections in consolidated democracies, last-minute vote buying may be the decisive factor. Prabowo-Hatta has an advantage here: bankrolled by his brother and other extraordinarily wealthy businessmen-politicians like Aburizal Bakrie, he has more resources available to buy votes (and turnout) tomorrow. Moreover, none of Prabowo’s actions in the past three months suggest that he would be averse to buying his way to victory through direct cash payments to voters. We can’t tell exactly how much of an advantage among the undecideds Prabowo would need to win the election. However, we can calculate how much of an advantage he would need to have among the undecideds in order to equalize his chances. I will use the Saiful Mujani Research and Consulting poll to illustrate. We know that the poll has 7.5% undecideds; with a sample size of 1997, this means 149 people. If we divide the undecideds evenly between Jokowi and Prabowo, this leaves our best guess as 1025 respondents for Jokowi and 972 for Prabowo. Now let’s say that 60% of undecideds go for Prabowo—a 20 percentage point advantage for Prabowo. 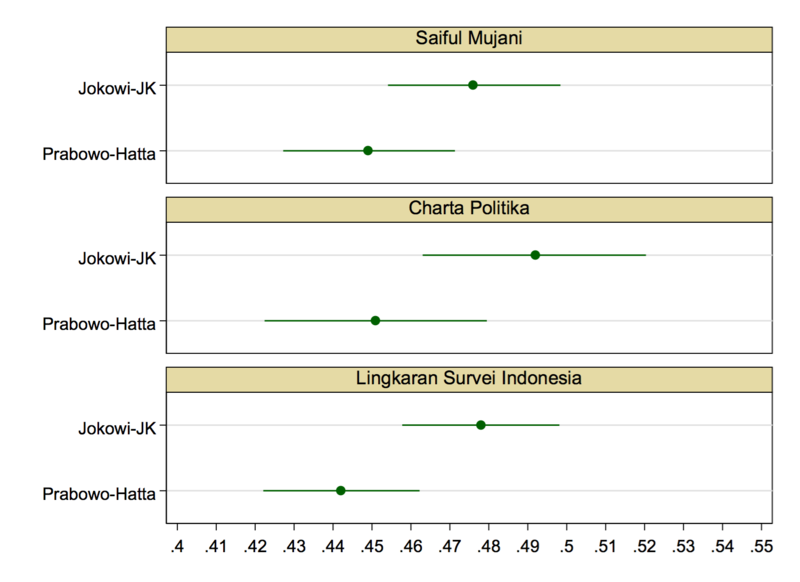 That leaves 1011 respondents for Jokowi and 986 for Prabowo, with our best guess still that Jokowi wins, but with a lower two-ticket vote share of only 50.6% (and accordingly more overlap in the CIs). We can keep going, adding more of an advantage for Prabowo. 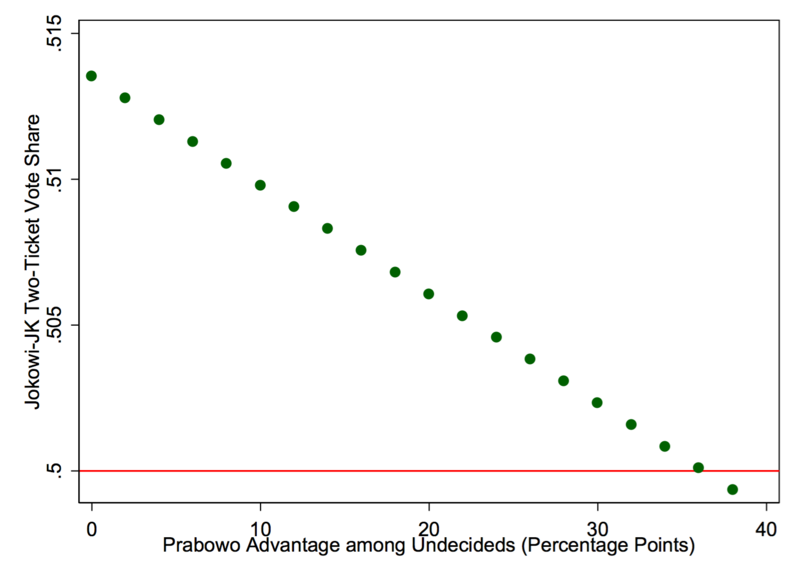 As it turns out, it takes about a 36 percentage point advantage for Prabowo among the undecideds (68% go for him) to equalize his chances, as the graph below illustrates. Such an advantage for Prabowo does not strike me as out of the question given the sheer amount of financial resources he has at his disposal. If Jokowi’s team is smart, they will do everything they can to mobilize their ground game tomorrow to keep vote buying at a minimum. Suffice it to say that this also depends on whether the Indonesia’s security forces remain neutral in tomorrow’s elections, and it is a worrying sign that civil society groups have to make this demand explicit. We’ll learn a lot more when the elections take place tomorrow. Watch this space for more. Great article. I’ve been wanting to write something similar.